Unfortunately, the Rabbit and Rooster relationship will be a difficult union. Both will have trouble understanding each other’s commitment to their respective lifestyles. Or it may just be that the rabbit won’t be able to understand commitment. These creatures shy away from anything too serious. And the rooster is a rather serious specimen, a slave to rule and order, the perfectionist of the Chinese Zodiac. The rabbit and rooster in love will require much communication and most likely even more forgiveness. But those are elements required in even the most perfect of unions, this pair will just have to work a lot harder. Though the love compatibility in this zodiac match isn’t too great, compromise and understanding between the couple can improve the situation. Although each Chinese animal sign demands perfection, they manifest it in different ways. The rabbit expects perfection from its partners, but their own form of perfection is adhering to the fantasy they have created in their own heads. They could play all day. Underneath their happy-go-lucky attitude, they are sensitive. The Chinese rooster, on the other hand, demands perfection from itself and all its dealings, a methodical and detailed approach to achieving their life goals. They are no-nonsense type of characters. They might have to sugarcoat a few of their choice of words. They will have to be very conscious of what they say and do. They might need to make time in their busy schedule for their partner, so the rabbit doesn’t start to feel neglected and uncared for. If not, their rabbit lover will start to think that the rooster values his or her own goals more than the relationship – which could very well be the case for many roosters, as driven as they are. Even in bed the rabbit and rooster soulmates will be critical of each other rather than sexually enjoying the moment. In fact, the rooster might end up scrutinizing the rabbit too harshly for its lifestyle. They can easily come across as too critical, too blunt, and too reckless in their obedience to practicality. And this will most likely hurt the rabbit’s feelings. The proud rooster is too practical for this dreamy rabbit. Yet, they will probably put up with it, but only for a little while, opting to avoid conflict within the relationship. But soon they run for good, disappearing from their lover’s life and thus leading to the breakup of the Rabbit Rooster relationship. Yet, in the rooster, the rabbit will find a stand-up individual. In times of need, the rooster man or rooster woman shines for those it loves, swooping in to save the day. This will provide a sense of security and make the rabbit man or rabbit woman in question why it ever doubted the them love in the first place. The male or female rabbit will feel as if its on top of the world again, in the arms of its rooster lover. Nevertheless, the male or female rooster will be a reliable partner, one that the rabbit will always be able to count on. Despite their differences, the rabbit and rooster marriage does share some common ground. They are both very particular about who they reveal themselves to. Beneath the rooster’s hard shell is a human being with a huge heart, willing to do whatever for those they love. The same can be said for the rabbit. It is a loving and caring individual, devoted when it finds its match. The Rabbit Rooster friendship can be a loyal pairing, so long as they understand that their seemingly preoccupied lives are not indicative of a lack of love for the other. 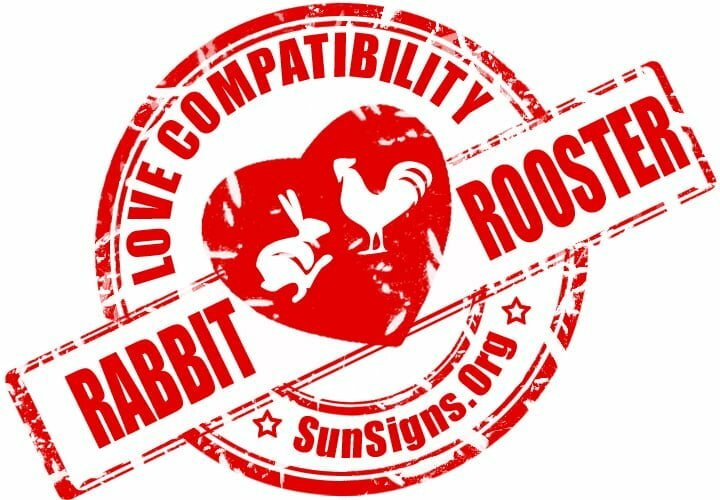 Rabbit & Rooster Chinese Horoscope Compatibility Rated 1 Hearts!